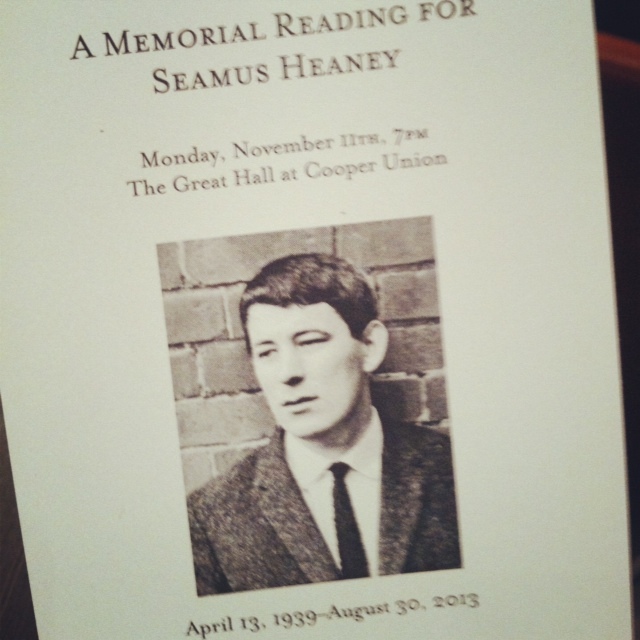 Program for Heaney Tribute at Cooper Union. A stellar lineup of poets, musicians, publishers, and poetry organizations gathered last night to pay tribute to Seamus Heaney. Heaney, the 1995 Nobel laureate in literature, died after a fall on Friday, August 30, 2013, in Dublin. He had suffered a stroke in 2006. The event, organized by the Poetry Society of America, the Academy of American Poets, Poets House, the Unterberg Poetry Center at the 92nd Street Y, the Irish Arts Center PoetryFest, and Farrar, Straus and Giroux, Heaney’s US publisher, took place at the Great Hall of Cooper Union in New York City, an appropriate venue for such a stentorian public poetic figure. Among the readers were Heaney’s fellow Irish poets Eamon Greenan, Eavan Boland, Greg Delanty, and Paul Muldoon, along with Tracy K. Smith, Kevin Young, Jane Hirshfield, and Yusef Komunyakaa. You can read the full list here: Heaney Tribute. One poem that was missing last night was one that I thought of shortly after hearing the news of Heaney’s death. We were heading out to Martha’s Vineyard for a week with Samantha’s family to celebrate the 70th year of her mother, Lee Langbaum. The New York Times the morning we left had Heaney’s picture on the front page and ran his obituary, but I couldn’t get to it until much later in the day, aboard the ferry. 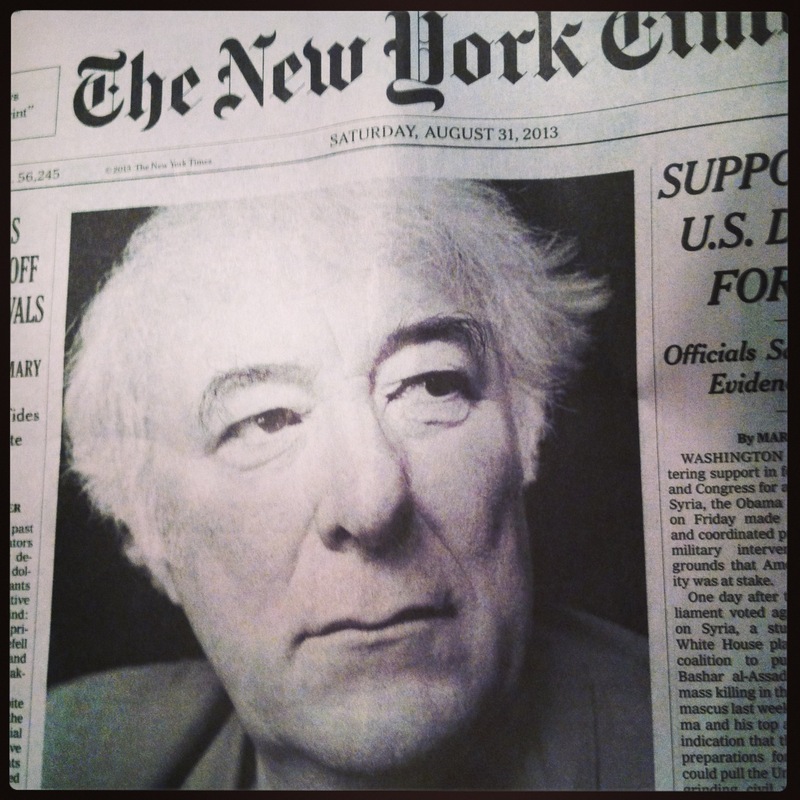 New York Times announcing Heaney’s death. It was sad news indeed, for those of us who loved his poetry and for the world that lost a remarkable voice. Heaney was a wonderful poet and a warmhearted man, as most of the people gathered at Cooper Union last night — whether on stage or off — would attest. I only met him twice, and only very briefly after readings, but he was gracious and generous both times. The last time I saw him was at a reading three years ago or so at Villanova University. The poem that came to mind on Martha’s Vineyard, came to me as we were talking with the oyster shucker outside of Home Port Restaurant in Menemsha. Of course it was “Oysters,” a poem that was missing last night.